Ochronotic Hip arthropathy can be successfully treated by total joint replacement, Complete excision of capsule reduces the risk of recurrence. 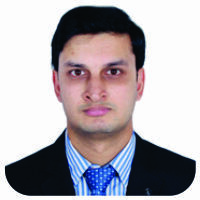 Fellow In Hip and Knee Arthroplasty, ORCID NO: 0000-0002-0652-5540. Introduction: Ochronosis is an inherited metabolic disease that causes a brownish-black pigmentation of the connective tissue. There is currently no specific treatment for ochronosis. 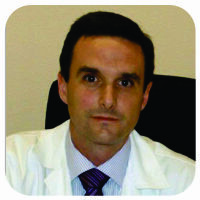 The goal of treatment is to control the progress of disease with a multidisciplinary approach and symptomatic relief. Arthroplasty in ochronotic arthropathy patients has shown good to excellent results comparable to arthroplasty performed in patients with degenerative osteoarthritis. Case Report: We report an unusual case of a 69-year-old female who suffered advanced degenerative arthropathy secondary to ochronosis. A staged bilateral total hip arthroplasty was performed on her successfully using a Corail metal on poly total hip prosthesis 9months apart. Conclusion: Ochronoticarthropathy produces degenerative arthritis of large joints in middle-aged patients. In many cases, the patient does not know the disease until the diagnosis of intraoperative suspicion. There is no definitive treatment. After conservative management, joint replacement surgery offers the best symptomatic treatment. 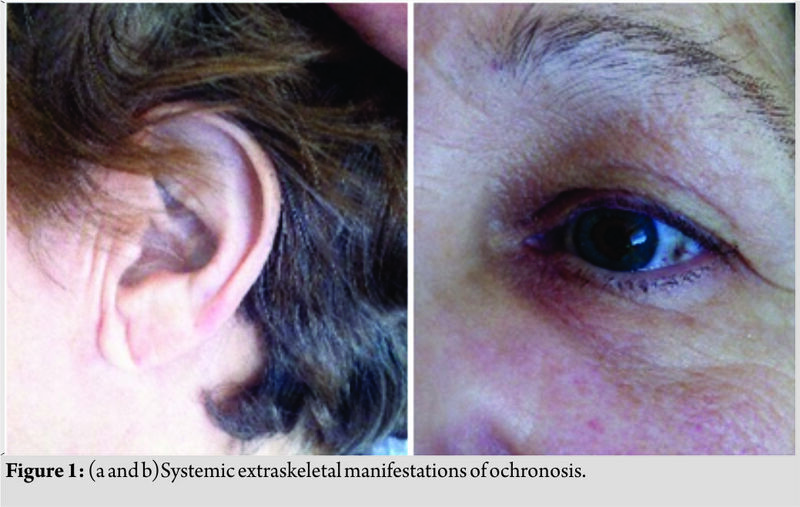 Keywords: Ochronosis, ochronoticarthropathy, total hip replacement, bilateral hip arthritis. Ochronosis is an inherited metabolic disease that causes a brownish-black pigmentation of the connective tissue, with a prevalence ranging from 1 case per 1,000,000 to 1 case per 250,000 people[1, 2]. 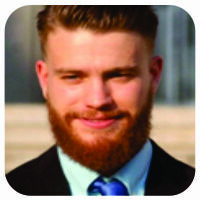 Homogentisic acid (HGA) oxidase enzyme deficiency causes an accumulation of excessive amounts of HGA in the connective tissue, associated with increased pigmentation and the attenuation of the connective tissue. As the disease progresses, the chronic inflammation of the damaged tissue leads to degeneration and eventually arthritis of large joints [1, 3]. There is currently no specific treatment for ochronosis. The goal of treatment is to control the progress of disease with a multidisciplinary approach and symptomatic relief. Arthroplasty in ochronoticarthropathy patients has shown good to excellent results comparable to arthroplasty performed in patients with degenerative osteoarthritis . There are no data in the literature regarding surgical technique to be considered during arthroplasty surgery in these patients. 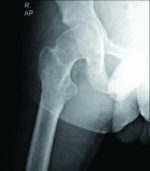 In this case, we report a 69-year-old female patient with bilateral ochronotic degenerative arthritis of the hip joints, who successfully underwent a staged total hip arthroplasty of both the hip joints. 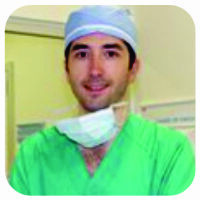 We also aim to report a useful surgical technique to prevent recurrence of the disease in the affected hip joint. We report a rare case of a 69-year-old female who presented to us with chronic bilateral groin pain. She was unable to sit cross-legged, squat, or walk comfortably for long distances. The patient was previously diagnosed hypertensive and dyslipidemia. She had previous multiple episodes of polyarthropathy. There was no relevant family history. 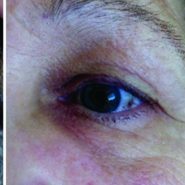 General physical examination revealed a bluish pigmentation of the sclera with blackish-brown pigmented spots and thickened ear lobules(Fig. 1a and b). The urinary HGA levels were 11500 mg/24 h (average normal being <10 in our laboratory). Plain radiographs of the hip and lumbar spine revealed significant advanced degenerative changes in both the hips and lumbar spine(Fig. 2a, b, c). Magnetic resonance imaging of the hips confirmed the same. The authors decided to proceed with a total hip replacement of both her hips. The goal of surgery was to obtain a painless range of motion for both her hips. A staged bilateral total hip replacement surgery was performed9months apart. The anterolateral approach was the preferred approach used by the treating author. Intraoperatively, the head of the femur presented a blackish-brown discoloration, and the surrounding tissues had a brownish tinge to them (Fig. 3). Special care was taken to remove as much of the capsule as possible to prevent local recurrence. The Corail Pinnacle poly on the metal implant with head size 32+1.5, stem size 11, and acetabulum cup size 50 was used for the left hip. The Corail Pinnacle poly on metal implant with head size 28+1.5, stem size 12, and acetabulum cup size 50 was used for the right hip. The post-operative period was uneventful (Fig. 4). The patient was made to ambulate within 3 days of surgery. The patient was initiated on a planned physiotherapy program. Our patient regained functional range of movements by the end of 3 months. The patient was independently ambulant and pain free with no complaints at the 1½-year follow-up. Alkaptonuria occurs due to the loss-of-function mutation on chromosome 3q, which leads to a defect in the homogentisate 1, 2-dioxygenase (HGO) or homogentisate 1, 2-dioxygenase enzymes [1, 3]. This enzyme is responsible for the breakdown of HGA. The defective enzyme leads to a build-up of HGA in tissues and blood over the years, and polymers of HGA are deposited in the tissues, causing the dark pigmentation encountered in these patients [4, 5, 6].At the walls of joint cartilage, tendons, ligament, skin, sclera, renal tubule epithelial cells, pancreas islet and some arteries [7, 8]. Excessive accumulation of HGA and oxidation products causes progressive tissue damage in the joint cartilage and other tissues involved. The tissues and urine change color into bluish-black and joints progress to concurrent degenerative arthritis. This deposition of HGA in tissues has been described as ochronosis. 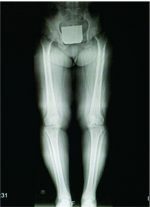 Ochronoticarthropathy is a term used to describe progressive arthropathy secondary to deposition of HGA in large joints, leading to degenerative arthritis. The most commonly affected joint is hip followed by theknee joint [1, 2, 3] Other joints like shoulder joint involvement have also been described in the literature. Small joints are not affected . Our patient had presented to us with bilateral hip pain due to ochronoticarthropathy. The diagnosis of ochronosisis often delayed until arthropathy develops and the patient is planned for surgery. In our patient, the diagnosis was made preoperatively evidenced by increased urinary HGA levels in 24 h which was 11,500 mg/24 h. Our patient was totally un aware of her condition before she presented to us in our hospital. The authors diagnosed her by clinical examination and by the abnormal laboratory reports. The treatment of alkaptonuria is not defined in the literature although various modalities of treatment have been recommended [9, 10, 11, 12, 13, 14]. The disease itself, however, cannot be reversed or cured. The goal of treatment of this disease is to control the progress of the disease and thereby to prevent HGA deposition in tissues and ochronoticarthropathy. The mainstay of treatment of ochronosisisadietary restriction of phenylalanine and tyrosine. However, long-term compliance of the diet restriction is a major drawback of this treatment regime. Ascorbic acid has shown to provide good results with control of the disease. It helps by preventing oxidation and polymerization of HGA in vitro . The exact efficacy of this is yet to be confirmed. Early ochronoticarthropathy can be treated with analgesics and physiotherapy along with supportive therapy such as weight loss, dietary control, and activity modification. Advanced ochronoticarthropathy, however, requires surgery in the form of total joint replacement. Good results have been seen with joint replacement with a low rate of recurrence of the disease [8,17]. Acar et al. described a case of ochronoticarthropathy in a 62-year-old female patient for which she underwent a staged arthroplasty of the hip and the knee joint 4 months apart. She was followed up for 18 months with no recurrence. There have been many reports published with ochronoticarthropathy of the hip successfully treated by arthroplasty. However, only Aynaci et al. reported a case of staged bilateral total hip arthroplasty successfully performed on a 53-year-old woman with ochronoticarthropathy 6 months apart . There is no literature, suggesting the advantages of staged bilateral THA performed over THA performed bilaterally in a single sitting in patients with ochronoticarthropathy. In our patient, conservative therapy was initiated first. After very limited success with conservative therapy for 1 year, a staged bilateral hip joint replacement was planned and performed in our patient with an interval of 9 months. Our patient was symptom free after bilateral hip replacement with no restriction of activities and was independently ambulant. During total hip replacement, it has been recommended to completely remove the capsule to prevent local recurrence of disease if the patient is diagnosed preoperatively or intraoperatively by assessing the texture of the tissues . The same was done in our patient as well. Osteophytes are not evident in ochronoticarthropathy, unlike degenerative osteoarthritis . Our patient was followed up for 1½years. Her Harris hip score at follow-up of 1 year was 81.9. Our patient was able to perform all her activities of daily living and work without restriction of movement of her hip joints or pain. Spencer et al. reported a 12-year follow-up of total joint replacement done in 11 joints including hip, knee, and shoulder joint of three patients. He reported a good function of all the prosthetic joints with no evidence of prosthetic failure .Aydoğdu et al. reported a satisfactory outcome of cementless total knee replacement at the end of 4-year follow-up . There has never been a case reported of a prosthetic failure following arthroplasty in patients with ochronosis. The limitation of this report is that this surgical technique was used in only one patient (both hips), and hence, this report may need further evidence to support the technique. We were able to perform bilateral total hip replacement in our patient with no recurrence at the end of 1½ years. The authors believe the aforementioned surgical technique is safe and useful to control the recurrence of disease in the involved joint. Ochronoticarthropathy of bilateral hip joint is rare. Good outcome can be achieved with THA. Recurrence of disease is a common complication, and careful surgical technique (capsule resection)should be employed to prevent the same. 1. Cebesoy O, Isik M, Subasi M, Kaya A, Bilgin F, Kaya O. Total hip replacement for an ochronotic patient: A technical trick. Am J Case Rep 2014;15:27-30. 2. Zatková A, de Bernabé DB, Poláková H, Zvarík M, Feráková E, Bosák V, et al. High frequency of alkaptonuria in Slovakia: evidence for the appearance of multiple mutations in HGO involving different mutational hot spots. Am J Hum Genet 2000;67:1333-9. 3. Spencer JM, Gibbons CL, Sharp RJ, Carr AJ, Athanasou NA. Arthroplasty for ochronotic arthritis: No failure of 11 replacements in 3 patients followed 6-12 years. Acta OrthopScand 2004;75:355-8. 4. Fernández-Cañón JM, Granadino B, Beltrán-Valero de Bernabé D, Renedo M, Fernández-Ruiz E, Peñalva MA, et al. The molecular basis of alkaptonuria. Nat Genet 1996;14:19-24. 5. Gaines JJ. The pathology of alkaptonuricochronosis. Hum Pathol 1989;20:40-6. 6. O’brien WM, La Du BN, Bunim JJ. Biochemical, pathologic and clinical aspects of alcaptonuria, ochronosisand ochronotic arthropathy. Am J Med 1963;34:813-38. 7. Resnick D, Niwayama G, editors. Resnick Bone and Joints Imaging.Alkaptonuria. Diagnosis of Bone and Joint Disorders. 2nd ed. Philadelphia, PA: W. B. Saunders; 1988. p. 1787-803. 8. Aydoğdu S, Cullu E, Ozsoy MH, Sur H. Cementless total knee arthroplasty in ochronotic arthropathy: A case report with a 4-year follow-up. J Arthroplasty 2000;15:539-43. 9. Suzuki Y, Oda K, Yoshikawa Y, Maeda Y, Suzuki T. A novel therapeutic trial of homogentisic aciduria in a murine model of alkaptonuria. J Hum Genet 1999;44:79-84. 10. Forslind K, Wollheim FA, Akesson B, Rydholm U. Alkaptonuria and ochronosis in three siblings. Ascorbic acid treatment monitored by urinary HGA excretion. Clin Exp Rheumatol 1988;6:289-92. 11. Keller JM, Macaulay W, Nercessian OA, Jaffe IA. New developments in ochronosis: Review of the literature. Rheumatol Int 2005;25:81-5. 12. Suwannarat P, O’Brien K, Perry MB, Sebring N, Bernardini I, Kaiser-Kupfer MI, et al. Use of nitisinone in patients with alkaptonuria. Metab Clin Exp 2005;54:719-28. 13. Ranganath LR, Jarvis JC, Gallagher JA. Recent advances in management of alkaptonuria (invited review; best practice article). J Clin Pathol 2013;66:367-73. 14. Introne WJ, Perry MB, Troendle J, Tsilou E, Kayser MA, Suwannarat P, et al. A 3-year randomized therapeutic trial of nitisinone in alkaptonuria. Mol Genet Metab 2011;103:307-14. 15. Al Essa M, Al-Shamsan L, Rashed MS, Ozand PT. Alkaptonuria: Case report and review of the literature. Ann Saudi Med 1998;18:442-4. 16. Cobey MC. Ochronosis A case report. Clin OrthopRelat Res 1972;87:233-4. 17. 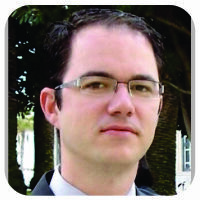 Dom K, Pittevils T. Ochronotic arthropathy: the black hip. Case report and review of the literature. Acta OrthopBelg 1997;63:122-5. 18. Acar MA, Erkocak OF, Aydin BK, Altan E, Senaran H, Elmadağ NM. Patients with black hip and black knee due to ochronotic arthropathy: Case report and review of literature. Oman Med J 2013;28:448-9. 19. Aynaci O, Onder C, Turhan AU. Bilateral hip arthroplasty for ochronotic arthropathy. Clin Rheumatol 2000;19:150-2.